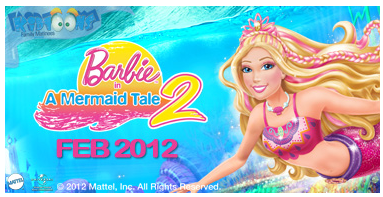 This month Kidtoons in featuring Barbie in A Mermaid Tale 2! Kidtoons is "dedicated to helping parents connect with their kids by bringing family friendly animated movies to the big screen." Find a Kidtoons location near you here. There have been lots of new theaters added. You can also find Barbie in a Mermaid Tale 2 Coloring Sheets! Giveaway will end Tuesday, February 28th at midnight MST. Winner will be chosen by Random.org. No compensation was received. Prize pack sponsored by Kidtoons. Email addresses will be deleted after giveaway. Your privacy is important. US residents only. My DD saw this on TV the other day and was SO EXCITED! "Mommy a barbie that swims!!!" Needless to say we REALLY hope we win! My daughter is so excited for this movie! Would love to win! My daughter would go nuts over this! My daughter would love to have any of these Barbies as she just loves them. My daughter loves anything to do with Barbie. My daughter loves barbies she would love this. My niece is a huge barbie fan. Thanks for hosting this giveaway! This looks like a good movie to take my daughter and niece to. My daughter is in love with barbies right now and her birthday is next week. Thanks for hosting a great giveaway! 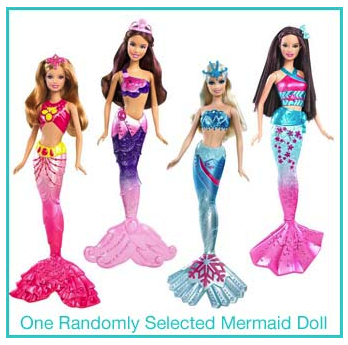 I love that Barbie has new Mermaids! This is such a cute giveaway! We can't wait to see the movie! My daughter loves barbies.. and mermaids! I know she would just love it! A Barbie that swims! How cool is that? kristiedonelson(at)gmail(dot)com Thank you. Would love to win this for my grandkids! I was a huge Barbie fan when I was younger and remeber playing with them until I was like 12. My little girl has now taken my place & she's the biggest Barbie fan I know! Her b-day is coming up real soon, so this would be awesome! My daughter would love this prize pack. We love all things Barbie at our house! My daughter has been asking me for this! This would be a great prize for my daughter, we are just starting our Barbie collection. One of my 5 grand daughters would love this for sure. Thanks for the giveaway...my goddaughter Eden is currently at the peak of her Barbie obsession...we hope. Thanks for the giveaway.. my daughters would love it.